Aiming with three stakes and a cord. How was mortar fire directed or pointed to a target? A stake, a foot or more in length, is driven vertically into the crest of the embankment in front of the mortar, sighting by this stake, an­other long one is planted, three or four feet in front of the first stake, in line with the target. To second stake the cord is temporarily attached, and stretched back to the first stake. 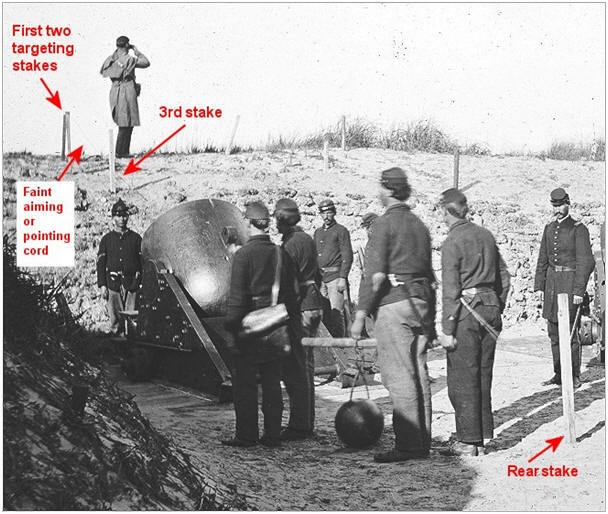 Next the position of a third stake is located at a point on the ground, one yard in rear of the mortar platform by sighting using the first two stakes and the cord. At this point a third stake is driven into the ground behind the mortar platform. The cord is removed from the second stake, and permanently attached to the first stake. To aim the mortar, the pointing cord is stretched across the barrel of the mortar, and is aligned to the mortar’s muzzle band along the line of metal of the barrel to the rear of the mortar. The line of metal is then brought to the plane of the cord and stakes by moving the rear of the mortar with shod handspikes. 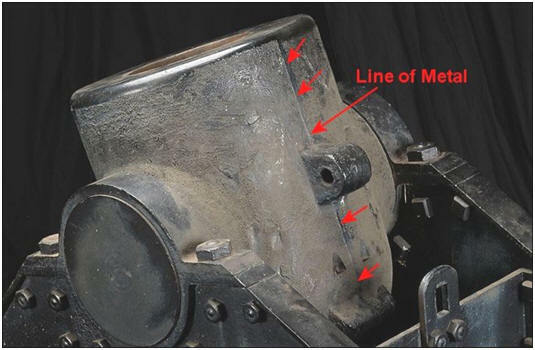 “Line of Metal” along casting seam of mortar barrel served as an exact center of barrel. Cord from stakes aligned plane of stakes with barrel center. Sometimes a white painted spot was substitute for the seam. Battery Reynolds. 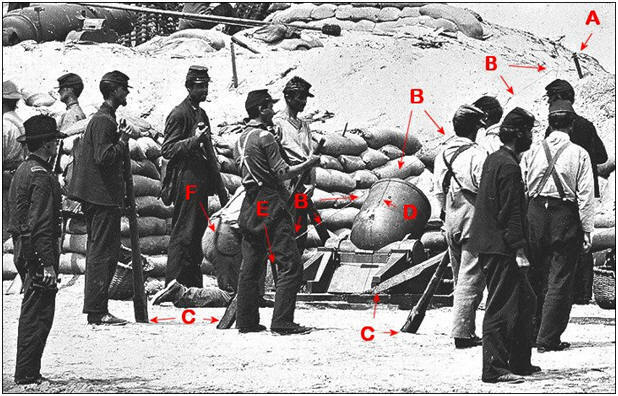 Preparation to fire 10-inch siege mortar against Fort Wagner, South Carolina: A – First stake (Second stake beyond crest of embankment); B – Pointing cord extending from A to E; C – Shod handspikes for adjusting mortar base along plane of stakes and cord; D – shadow of cord across mortar barrel; E – Third stake at rear of mortar platform; F – Gunner aligning barrel via handspikes to plane of stakes and cord. Battery Reynolds. About to fire 10-inch siege mortar with lanyard and fuse in position. Rear aiming stake shown along with gunner’s wicker basket with vent punch and gunner’s quadrant, a 22.3-inch wood arm with a 6-inch quarter radius circle. The outer edge of the circle was graduated in degrees. There was a plumb bob attached to the center of the circle and when the quadrant was inserted into the mortar’s barrel the elevation of the tube was read and checked against the radius circle. 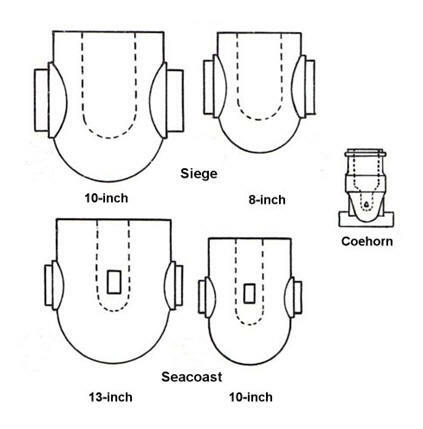 The elevation of the mortar is normally at 45 degrees. 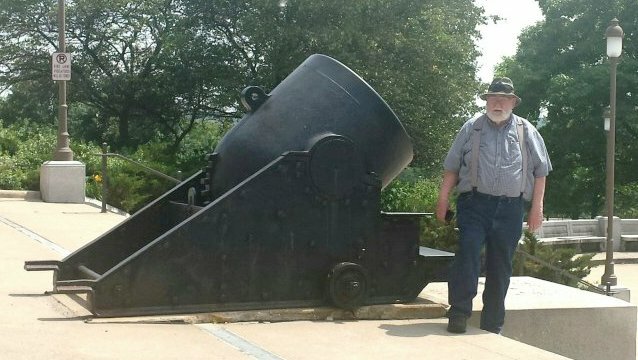 The battery was equipped with an spade-shaped iron scraper that was used to remove the burnt powder from the barrel after each shot and the broom was used to sweep the power residue away from the platform. Morris Island, S.C. Federal 13-inch seacoast mortar aimed at Fort Sumter, with crew. Note white spot at center of mortar’s muzzle band used for aligning mortar to aiming stakes and pointing cord. 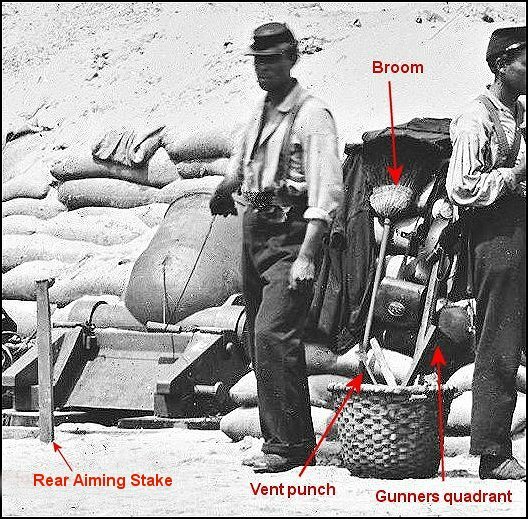 If a shot from the mortar consistently fell to the right or left of its target, a pointing board was attached to the rear stake. The board was about 1-foot long and had a set of equally spaced notches away from its center notch. The pointing cord was shifted to some notch to the right or left to compensate. The mortar was realigned to the new location of the pointing cord and fired till the desired target was stuck. When not in use, the pointing cord was wrapped around the pointing board. Pointing a mortar at night was virtually impossible, so pieces to be fired after dark were laid out during the day. The direction to the target was preserved by nailing or screwing two wooden guide strips to the wooden platform outside of the carriage cheeks. 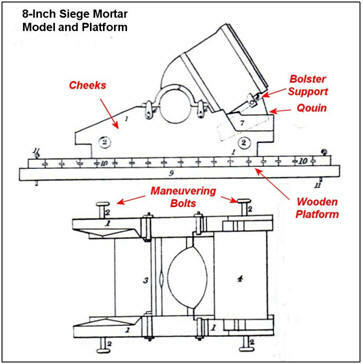 The elevation of the barrel was marked on the quoin or wedge used to elevate the mortar or the quoin was nailed into the proper position, or a cleat was nailed to the bolster.